Many tumours undergo disregulation of polyamine homeostasis and upregulation of ornithine decarboxylase (ODC) activity, which can promote carcinogenesis. In animal models of colon carcinogenesis, inhibition of ODC activity by difluoromethylornithine (DFMO) has been shown to reduce the number and size of colon adenomas and carcinomas. Indole-3-carbinol (I3C) has shown promising chemopreventive activity against a range of human tumour cell types, but little is known about the effect of this agent on colon cell lines. Here, we investigated whether inhibition of ODC by I3C could contribute to a chemopreventive effect in colon cell lines. Cell cycle progression and induction of apoptosis were assessed by flow cytometry. Ornithine decarboxylase activity was determined by liberation of CO2 from 14C-labelled substrate, and polyamine levels were measured by HPLC. I3C inhibited proliferation of the human colon tumour cell lines HT29 and SW480, and of the normal tissue-derived HCEC line, and at higher concentrations induced apoptosis in SW480 cells. The agent also caused a decrease in ODC activity in a dose-dependent manner. 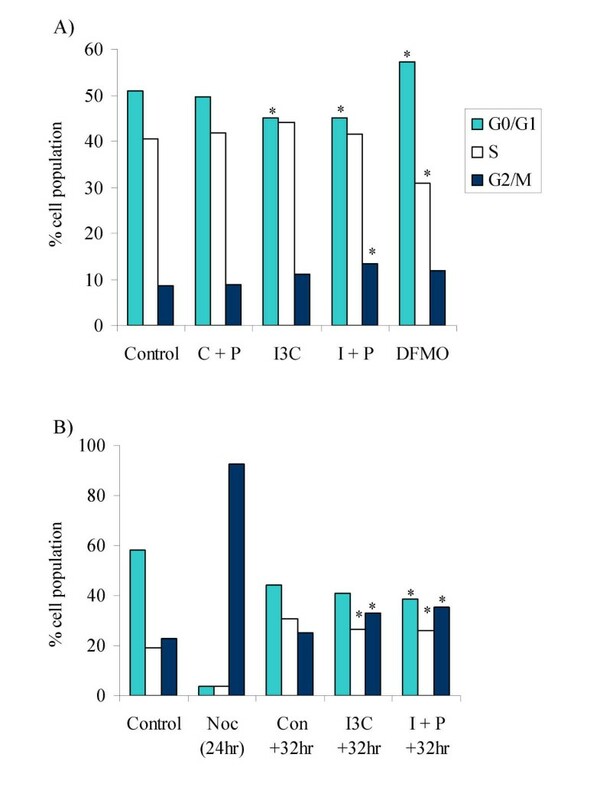 While administration of exogenous putrescine reversed the growth-inhibitory effect of DFMO, it did not reverse the growth-inhibition following an I3C treatment, and in the case of the SW480 cell line, the effect was actually enhanced. In this cell line, combination treatment caused a slight increase in the proportion of cells in the G2/M phase of the cell cycle, and increased the proportion of cells undergoing necrosis, but did not predispose cells to apoptosis. Indole-3-carbinol also caused an increase in intracellular spermine levels, which was not modulated by putrescine co-administration. While indole-3-carbinol decreased ornithine decarboxylase activity in the colon cell lines, it appears unlikely that this constitutes a major mechanism by which the agent exerts its antiproliferative effect, although accumulation of spermine may cause cytotoxicity and contribute to cell death. The precise mechanism by which putrescine enhances the growth inhibitory effect of the agent remains to be elucidated, but does result in cells undergoing necrosis, possibly following accumulation in the G2/M phase of the cell cycle. There is strong epidemiological evidence to support a protective role of fruit and vegetables against the development of cancer in a range of major organs, in particular of the breast and the digestive tract. This evidence has led to the isolation and characterisation of discreet dietary constituents that may be responsible for their chemopreventive activity. I3C is derived from cruciferous vegetables such as broccoli and Brussels sprouts, and possesses anticarcinogenic activity in a number of models, both in vivo and in vitro. It has received considerable attention as a potential anti-tumour agent for breast cancer, particularly due to its ability to alter the estrogen metabolite ratio of 2-hydroxyestrone to 16-α-hydroxyestrone [1–3], and has recently been the subject of a breast cancer prevention dose-finding pilot study using the urinary estrogen metabolite ratio as the surrogate endpoint biomarker . Promising results have been obtained in phase I clinical trials of I3C against recurrent respiratory papillomatosis or cervical intraepithelial neoplasia [5, 6]. I3C has also been shown to protect against carcinogen-induced tumours in a range of rodent models including liver, tongue, skin, mammary tissue and colon [7–12]. Some studies however, have suggested that when administered after chemically-induced initiation, I3C may have promoting activity in liver, raising concerns as to its suitability for use as a chemopreventive agent in humans [12–15]. The latter two of these studies showed that in medium and long-term treatment protocols (10 and 30 weeks respectively), I3C increased glutathione S-transferase-P (GST-P) positive foci in livers of rats initiated with diethylnitrosamine , or in a multi-organ rat model initiated with 7,12-Dimethylbenz [a]anthracene plus azoxymethane plus AFB1 , and these results were interpreted as indicating a promoting effect of I3C on hepatocarcinogenesis. In a long-term (48 week) feeding study we showed that I3C prevented aflatoxin B1 (AFB1)-induced liver carcinogenesis in Fisher F344 rats, irrespective of whether it was administered before or after the carcinogen . Interestingly, at an earlier time point in our feeding study (13 weeks) we observed strong focal liver staining for γ-glutamyl transpeptidase and GST-P in rats treated with I3C post-initiation. Using these criteria alone as predictors of tumourigenesis, we would have expected no effect, or indeed an increase in tumours in the livers of these animals. However this was not the case, and at 48 weeks the animals treated with I3C following AFB1 were completely protected . While the mechanism by which I3C exerts tumour blocking activity has been attributed to the induction of drug metabolising enzymes, which can lead to increased conjugation and excretion of the carcinogen and decreased DNA adduct formation [16–23], the mechanisms by which it suppresses tumour promotion and progression are not well defined. Inhibition of ornithine decarboxylase (ODC) activity has been proposed as a target mechanism for tumour suppression, reviewed by Pegg . ODC is the rate-limiting enzyme in the biosynthesis of polyamines, which are required for normal cell proliferation. Polyamine levels and ODC activity are elevated in a wide range of tumours, and high levels correlate with poor prognosis in breast cancer patients [25–27]. ODC has further been implicated in the carcinogenic process by findings that overexpression promotes tumourigenesis in vivo, and can be sufficient for transformation of cell lines in vitro [28–31]. Therefore inhibition of ODC activity has been commonly used as a predictor of chemopreventive activity, and as an intermediate endpoint biomarker of clinical efficacy in intervention studies. The regulation of ODC activity within the cell is complex, and occurs at a multitude of levels, [32–34], including protein degradation, post-translational modification, mRNA translation and gene transcription. ODC protein levels are regulated by antizyme, which binds to, and targets ODC for degradation by the 26S proteasome, reviewed in . ODC is also heavily regulated at the level of mRNA translation due to secondary structure in the 5' untranslated region, which can be modified by activity of the translation initiation factor eIF-4E [32, 36]. The ODC promoter has been shown in various species to be regulated by a number of transcription factors, including the Wilms' tumour suppressor WT1 [37–40] and references therein. ODC activity can also be modulated in response to many signalling pathways including the epidermal growth factor receptor, phospho-inositide 3-kinase (PI3K), and estrogen receptor pathways [41–44]. In the long term feeding study mentioned above , the level of ODC activity in livers of rats which received dietary I3C was markedly decreased compared to that in rats on a control diet. The current study was designed to explore whether alteration of ODC activity and polyamine levels might play a mechanistic role in the chemopreventive efficacy of I3C in colon cells. To that end the effects of I3C on cell growth, ODC activity and intracellular polyamine levels were studied in human-derived colon cancer cells. Difluoromethylornithine (DFMO) is a well-studied specific inhibitor of ODC enzyme activity. Initial trials of DFMO as a cancer therapeutic agent were disappointing, showing dose-limiting toxicity, together with little therapeutic activity. The contents of the intestinal and colonic lumen form a rich supply of polyamines, augmented by dietary sources and intestinal bacteria [45–49]. Exogenous polyamines are rapidly taken up by polyamine-depleted cells, and can be utilised for tumour growth , offering one explanation for the apparent lack of activity of DFMO in humans. However, more recently, DFMO has attracted much interest as a potential chemopreventive agent at lower doses [51–58]. In order to determine any similarity in mechanism of chemopreventive activity between I3C and DFMO the modulation of the growth inhibitory effects of the two agents by polyamines was investigated. Immortalized human colon epithelial cells (HCEC) and human-derived colon carcinoma cell lines SW480 and HT29 were kindly provided by A. Pfeifer (Nestec Ltd., Lausanne, Switzerland) and C. Paraskeva (Bristol University, UK), respectively, and were cultured as described previously [59, 60]. All cell lines tested negative for mycoplasma infection and were cultured without antibiotics. I3C (Sigma-Aldrich Company Ltd.; Poole, UK) was prepared as a stock solution in DMSO, and cells were treated in such a way that all control and treated cells received equal volumes of DMSO, which did not exceed a final concentration of 0.05%. For each experiment, cells were seeded in normal growth medium and were allowed to adhere for at least 4 hours before treatment. Cells were treated with concentrations of I3C from 100 μM up to 1 mM in some experiments. It should be noted that any effects seen at concentrations above 500 μM are unlikely to be physiologically relevant. All cell culture reagents (GIBCO) were purchased from Invitrogen Ltd. (Paisley, UK). Cells were seeded at 1 × 104 onto 24 well plates in normal growth medium, and allowed to adhere, prior to treatment with I3C for times up to 10 days. The culture medium was not changed during the incubation time. Cells were harvested by trypsinisation at 24 hourly intervals and counted on a Coulter ZM electronic cell counter (Beckman Coulter UK Ltd., High Wycombe, UK). Mean IC50 values were obtained from plots of cell number expressed as a percentage of control, versus I3C concentration following treatment for 7 days. 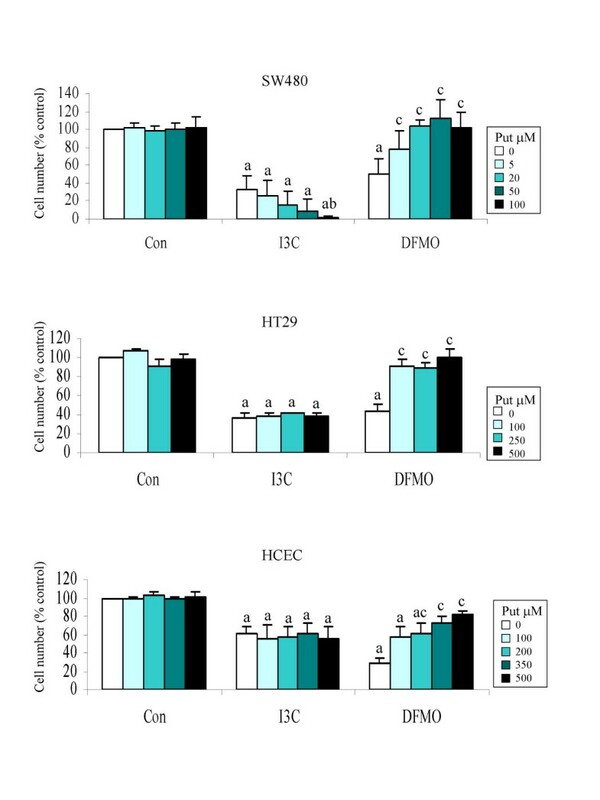 In further growth experiments, HT29 and SW480 cells were treated with concentrations of I3C (250 or 175 μM respectively), or DFMO (125 or 50 μM; CN Biosciences (UK) Ltd., Beeston, UK), and cultured for 7 days in the presence or absence of putrescine as indicated. To determine their ability to recover proliferative capacity following treatment, cells (1 × 104 on 12 well plates) were cultured in the presence of I3C, plus or minus putrescine, for 24 hours, after which they were either maintained in treated medium or washed and replenished with fresh medium and allowed to recover before harvesting on day 7. The proliferation rate of cells was calculated as fold increase in cell number following the initial treatment period. For analysis of cell cycle, 5 × 105 cells were seeded onto 9 cm plates and treated with I3C in the presence or absence of putrescine for 96 hours. Cells were harvested by trypsinisation and fixed overnight in 70% ethanol at 4°C, then collected by centrifugation and resuspended in PBS containing 0.1 mg/ml RNase and 5 μg/ml propidium iodide and incubated overnight at 4°C. DNA content was analysed using a Becton Dickinson FACScan and Cell Quest software, plotting 5000 events per sample. Subsequent data analysis was performed using ModFit LT software (Becton Dickinson UK Ltd.; Cowley, UK). Cells were seeded at 2–5 × 105 onto 9 cm plates and treated with I3C for 96 hours. After treatment, cells obtained by trypsinisation were combined with those that had spontaneously detached during the incubation. Phosphatidylserine externalisation was determined by annexin V staining. Cells were pelleted and resuspended in 1 ml annexin buffer (10 mM HEPES pH 7.4, 150 mM NaCl, 5 mM KCl, 1 mM MgCl2, 1.8 mM CaCl2). FITC-conjugated annexin V was added to a final concentration of 100 ng/ml and cells were incubated for 8 min at room temperature, after which propidium iodide (1.5 μg) was added and cells were analysed by flow cytometry using a FACScan flow cytometer (Becton Dickinson, San Jose, CA) and Cell Quest software. Colon cells were seeded at 5 × 105 onto 9 cm plates and allowed to adhere prior to treatment with I3C for 24 hours. Whole cell lysates were prepared by successive rounds of freeze thawing of cells suspended in 200 μl sodium phosphate buffer (100 mM, pH 7.2). ODC activity in cell lysates (90 μl) was determined by measurement of 14CO2 released from labelled ornithine, under reaction conditions described previously . Protein content of cell lysates was determined using the BioRad protein assay kit (Bio-Rad Laboratories Ltd., Hemel Hempstead, UK). ODC activity was calculated as pmol CO2 produced/ mg protein/ hour, and results are expressed as a percentage of activity in control samples (DMSO-treated). Cells seeded onto 9 cm plates at densities between 5 × 105 and 2 × 106 depending on treatment time, were treated with I3C in the presence or absence of putrescine for 24, 96 or 168 hours, and were then harvested and washed twice with PBS. Cell pellets were resuspended in 200 μl 10% trichloroacetic acid, and the acid-soluble polyamines extracted by centrifugation. Dansylated polyamines were detected by fluorescence, following separation by ion-pairing reversed phase HPLC. Dansylation and extraction of polyamines was based on published methods [61, 62]. In brief, extracts were mixed with 400 μl dansyl chloride (5 mg/ml in acetone) in the presence of approximately 300 mg solid sodium carbonate, together with 500 nmol of the internal standard 1,6-hexanediamine, and incubated for 20 min at 70°C. Reactions were allowed to cool to room temperature and excess dansyl chloride was sequestered by the addition of 200 μl proline (250 mg/ml). Polyamines were then extracted into 4 ml cyclohexane, and following evaporation of the cyclohexane were reconstituted in 200 μl acetonitrile. Dansylated polyamines were separated and detected using a Gilson 715 series HPLC system with a BDS C18 column (250 × 4.6 mm, particle size 3 μm, Hypersil, Runcorn, UK) coupled to a Waters 470 scanning fluorescence detector (excitation 336 nm, emission 520 nm). The mobile phase consisted of a gradient between buffer A (0.02 M 1-heptanesulphonic acid (pH 3.4), acetonitrile, methanol (5:3:2 v/v)) and buffer B (acetonitrile, methanol (3:2 v/v)) essentially as described by Aboul-Enein and Al-Duraibi . SW480 cells were seeded at 5 × 104 onto 24 well plates, and treated with I3C (0–500 μM) or DFMO (50 μM) in 1 ml medium for 24 hours. Cells were then treated with 10 μl 10 mM putrescine containing 0.25 μCi 14C-labelled putrescine, and incubated for a further 30 min prior to termination of the experiment. Cells were then washed thoroughly with 1 mM putrescine, and lysed in 250 μl 1 M NaOH 60°C for 1 hour. The lysate was neutralised with 250 μl 1 M HCl, and 14C-labelled putrescine that had been incorporated into the cells was determined by scintillation counting. Protein content of the lysates was determined using the BioRad protein assay reagent. Cells were seeded at 5 × 104 to 1 × 106 onto 6 well plates (according to treatment time) and treated with I3C in the presence or absence of putrescine for 24, 96 or 168 hours. Cells were harvested by trypsinisation and intracellular glutathione levels were determined according to the method of Baker et al. .
Data were analysed by ANOVA using either Oneway analysis followed by Tukey's posthoc test, or the General Linear Model twoway analysis followed by Fisher's Least Significant Difference test, as appropriate [65, 66]. 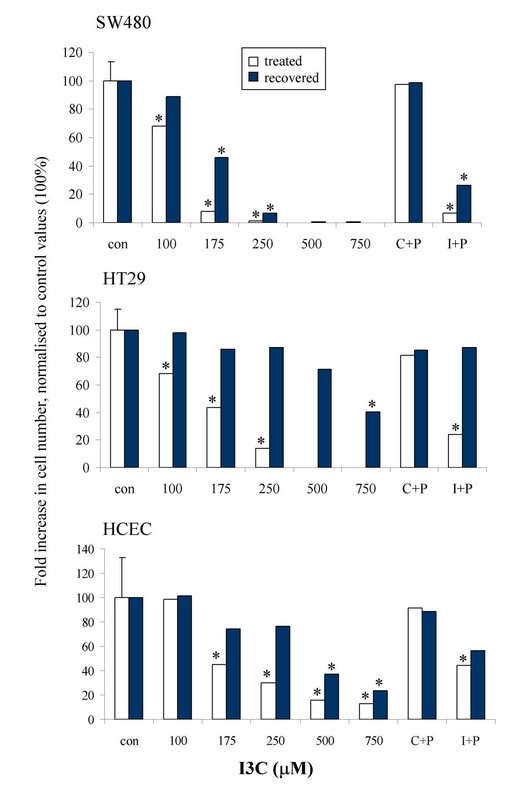 I3C inhibited proliferation of the two tumour-derived colon cell lines SW480 and HT29, and of the normal-derived HCEC cell line (Fig 1). The IC50s (mean ± SD, n = 3; 168 hr) for the SW480, HT29 and HCEC cell lines were calculated as 123.22 ± 8.87; 127.20 ± 8.13 and 164.5 ± 7.0 μM respectively. These values are consistent with concentrations reported to exert biological activity in a range of other cell lines [67–70]. The basal level of ODC activity was low in the normal-derived HCEC line, 156.1 ± 9.3 pmol CO2 produced/ hour/ mg protein, while levels were found to vary markedly between the two tumour cell lines. The HT29 line showed high activity, 1079.0 ± 42.4, while the SW480 line exhibited activity of 171.3 ± 20.9 pmol CO2 produced/ hour/ mg protein. The SW480 cell line is unusual in this respect, as tumour derived cell lines commonly exhibit high levels of ODC activity. I3C decreased basal ODC activity in a dose-dependent manner in all three colon cell lines after treatment for 24 hours (Fig 2), with the HCEC line showing greatest sensitivity, and the SW480 line showing least inhibition. I3C did not inhibit ODC activity when the agent was added directly into an assay (data not shown), indicating that the agent does not act as a direct enzyme inhibitor. Interestingly, the HCEC cell line showed the least decrease in cell number in response to I3C at this time point. This lack of apparent cytotoxicity is in agreement with a recent study by Bonnesen et al. , which reported an IC50 in excess of 500 μM I3C in this cell line using MTT tests carried out after 24 hours. Inhibition of cell growth by I3C. Cells were treated with I3C and counted at 24 hourly intervals as described in Materials and Methods. Results are presented as mean ± SEM (n = 6), * indicates significant difference from control cell numbers at that time point (P < 0.05). Effect of I3C on basal ODC activity and cell number after 24 hours. ODC activity in cell lysates was determined as described in Materials and Methods. Results are expressed as a percentage of control values (n = minimum of 5; pooled SD of each set for ODC activity and cell number for each cell line are: SW480, 18.76, 11.38; HT29, 13.12, 4.11; HCEC, 15.22, 12.37 respectively). Significant difference from the control (DMSO treated) is indicated by * (P < 0.05). To determine the extent to which inhibition of ODC activity contributed to the antiproliferative activity of I3C in the tumour lines, we made a comparison of its growth inhibitory effect with that of the specific ODC inhibitor, and known antitumour agent, DFMO. The growth inhibitory action of DFMO can be reversed by exogenously added putrescine, which restores intracellular levels of polyamines required for cell proliferation. In all three cell lines, supplementation of culture medium with putrescine reversed the effects of DFMO as expected, and in agreement with data obtained for the HT29 cell line by Gamet et al. . We hypothesised therefore that if the growth-inhibitory effect of I3C was directly related to its ability to decrease ODC activity, then as for DFMO, this may be reversed by supplementation with putrescine. 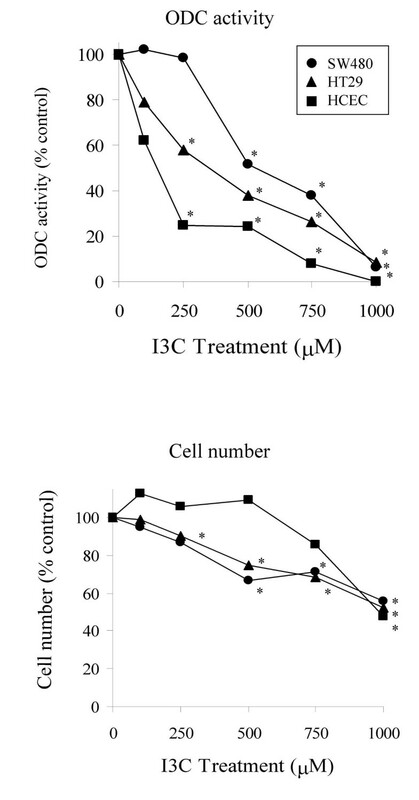 Interestingly, putrescine did not reverse the inhibitory effect caused by I3C in any of the colon cell lines, and at concentrations that did not affect control cell growth (5–100 μM), it actually increased growth inhibition of I3C-treated SW480 cells in a dose-dependent manner (Fig. 3; p < 0.05). This cell line was also found to be particularly sensitive to exogenously added putrescine, with concentrations in excess of 100 μM inhibiting proliferation of control cells. In contrast, the HT29 and HCEC cell lines were resistant to concentrations of exogenous putrescine up to 500 μM, whether cultured with or without I3C. Effect of putrescine supplementation on cell growth inhibition by I3C and DFMO. Cells were treated with I3C (SW480 175 μM; HT29 250 μM; HCEC 180 μM) or DFMO (SW480 50 μM; HT29 and HCEC 125 μM) or DMSO (control) and cultured in the presence or absence of putrescine (5–500 μM) for 7 days and then counted as described in Materials and Methods. Results are mean ± SD (n = 4), a indicates bars which are significantly different from control (DMSO without putrescine) group, b indicates significant difference from the I3C alone treatment, and c indicates significant difference from the DFMO alone treatment (P < 0.05). The cell lines also differed in their ability to recover from treatment with I3C (Fig 4). The HT29 cell line recovered completely from 24 hour treatment with I3C up to 500 μM, and also recovered from combined I3C (250 μM)/ putrescine (500 μM) treatment. In contrast, SW480 cells only partially recovered from 24 hour treatment with I3C at 175 μM in the presence or absence of putrescine (50 μM), and were unable to recover from higher concentrations of I3C. The HCEC cell line behaved more like the HT29 line, but did not recover completely. The reason for this apparent difference in the ability of the two tumour cell lines to recover from treatment is not clear at the present time. However, these data may suggest that I3C could be acting via different mechanisms, one reversible and one irreversible; alternatively, it is also possible that the effect is time dependent and that treatment with I3C for a longer period would have resulted in irreversible growth inhibition in the HT29 cell line also. We have previously observed a difference in the ability of two breast cell lines, HBL100 and MDA MB468 to recover from I3C treatment , which we concluded was related to the induction of apoptosis in the latter, but not in the former cell line. Recovery of cells from 24 hour treatment with I3C. Cells were cultured in the presence of I3C for 24 hours, after which cells were either maintained in I3C-containing medium or replenished with fresh medium and allowed to recover, as described in Materials and Methods. Cell proliferation is expressed as a % of the control values, data are presented as mean ± pooled SD (shown on control bar only; n = 3). Significant difference from the control (DMSO treated) is indicated by * (P < 0.05). 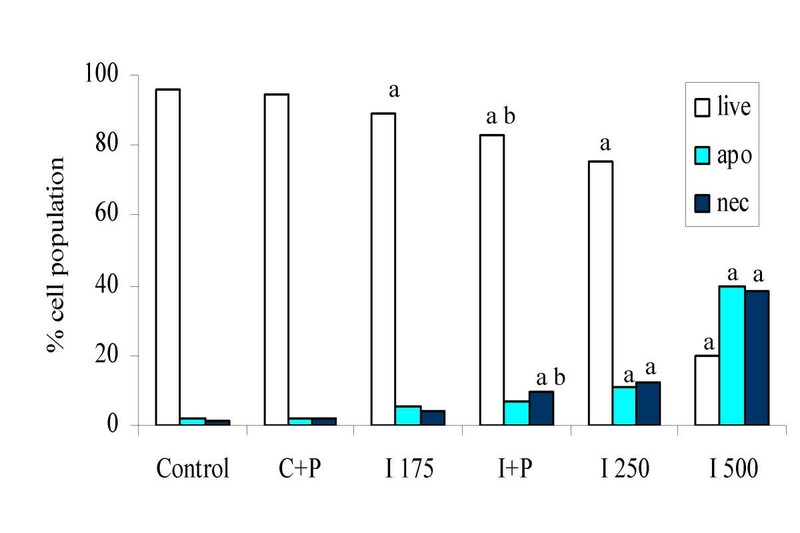 In order to investigate whether I3C induces apoptosis in colon cells, and to address the possibility that the combination treatment of I3C plus putrescine may predispose SW480 cells to apoptosis, we compared levels of live, apoptotic and necrotic cells, determined by measurement of phosphatidylserine externalisation after treatment with I3C alone, I3C plus putrescine, or DFMO. Treatment with I3C caused significant induction of apoptosis in the SW480 cell line at 250 and 500 μM after 96 hour treatment, but only slight induction was apparent with 175 μM (Fig 5). Induction of apoptosis was accompanied by an increase in necrotic cells, possibly due to secondary necrosis of previously apoptotic cells. It seems unlikely that the low level of apoptosis seen in response to 175 μM I3C after 96 hours could account for the apparently irreversible nature of growth inhibition observed for this concentration in the SW480 cell line. Induction of apoptosis or necrosis in SW480 cells by I3C in the presence or absence of putrescine. Cells were treated for 96 hours and then harvested and stained for phosphatidylserine externalisation and propidium iodide incorporation before analysis by flow cytometry as described in Materials and Methods. Control = DMSO treated cells, C+P = DMSO plus putrescine (50 μM), I175, I250, I500 = I3C (at the given concentration) and I+P = I3C (175 μM) plus putrescine. Significant difference from control is indicated by a, and between the I3C 175 μM and I3C + putrescine treatment by b (P < 0.05). Results are displayed as means (n = 12), pooled SD = 6.08. The combination treatment did not further induce apoptosis, but did cause a significant increase in the proportion of cells undergoing necrosis (9.5% in the I3C + putrescine treatment compared with 4% for I3C 175 μM alone; P < 0.05). The effect of combination of putrescine with higher concentrations of I3C (250 or 500 μM) was not assessed due to the high level of toxicity encountered with the original combination treatment (I3C 175 μM + putrescine). 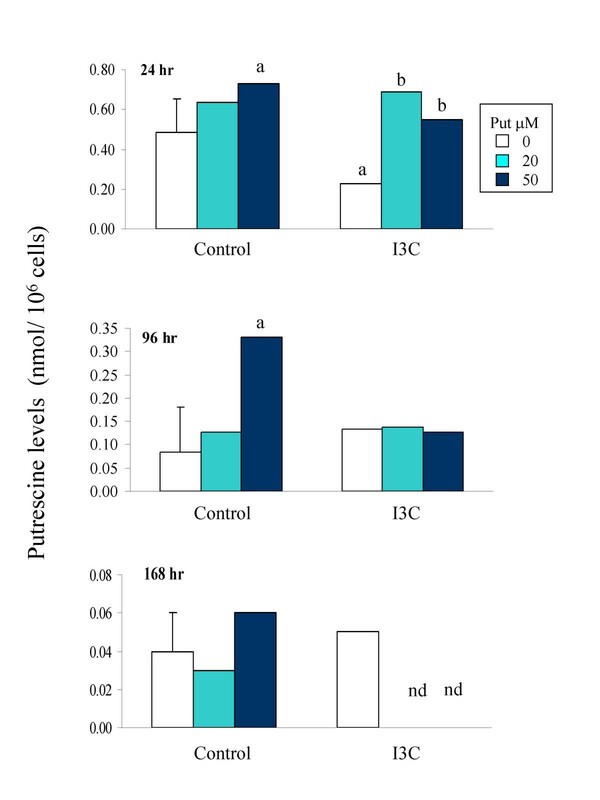 Putrescine alone had no effect on control cells. DFMO did not induce apoptosis or necrosis following treatment for 96 hours (data not shown). We also investigated whether cell cycle arrest may contribute to the inhibition of cell growth at these concentrations. DFMO caused an increase in the proportion of cells in G0/G1 phase of the cell cycle in both tumour cell lines, as has been previously reported in other cell lines [73–75]. No major phase specific block in cell cycle progression was observed following treatment with I3C alone or in combination with putrescine for 96 hours in either cell line. However, I3C caused a small but significant decrease in G0/G1, which was accompanied by an increase in the proportion of cells in G2/M in the SW480 cell line. Accumulation of cells in G2/M achieved significance in the I3C + putrescine treatment compared with control SW480 cells, but was not significantly elevated above levels of I3C treated cells (Fig. 6A). In order to further investigate this effect, cells were first synchronised in G2/M by treatment with nocodazole, and then released into either control or I3C ± putrescine-treated medium. Neither I3C alone, nor in combination with putrescine caused a delay in exit of cells from G2/M, however, cells in both treatment groups appeared to accumulate in G2/M by 32 hours after release (Fig 6B). The agents did not prolong progression of cells through any phase of the cycle within 24 hours of release from nocodazole block. Effect of I3C in the presence or absence of putrescine on progression of SW480 cells through the cell cycle. A) Cells were treated for 96 hours as indicated, and stained with propidium iodide before analysis by flow cytometry as described in Materials and Methods. Control = DMSO treated cells, C+P = DMSO plus putrescine (50 μM), I3C = I3C (175 μM) and I+P = I3C (175 μM) plus putrescine, DFMO = DFMO (50 μM). * indicates a significant difference from control levels (P < 0.05; n = 8; pooled SD = 3.54). B) Cells were synchronised with nocodazole for 24 hr (Noc (24 hr)) and then released into control (Con +32 hr), I3C (I3C +32 hr) or I+P (I+P +32 hr) treated medium and analysed as described in Materials and Methods. Data from the +32 hr time point is shown. Control = DMSO treated, non-synchronised cells. * indicates a significant difference from the Con +32 hr value for each phase of the cell cycle (P < 0.05; n = 4; pooled SD = 2.61). To investigate whether modulation of intracellular polyamine levels could be contributing to the sensitisation of the SW480 cells to I3C by putrescine, intracellular putrescine, spermidine and spermine levels were measured after treatment with I3C in the presence or absence of putrescine. In control cells at the 24 hour time point, spermine was the most abundant of the polyamines analysed, occurring at levels approximately 1.5 and 4 fold higher than spermidine and putrescine respectively. 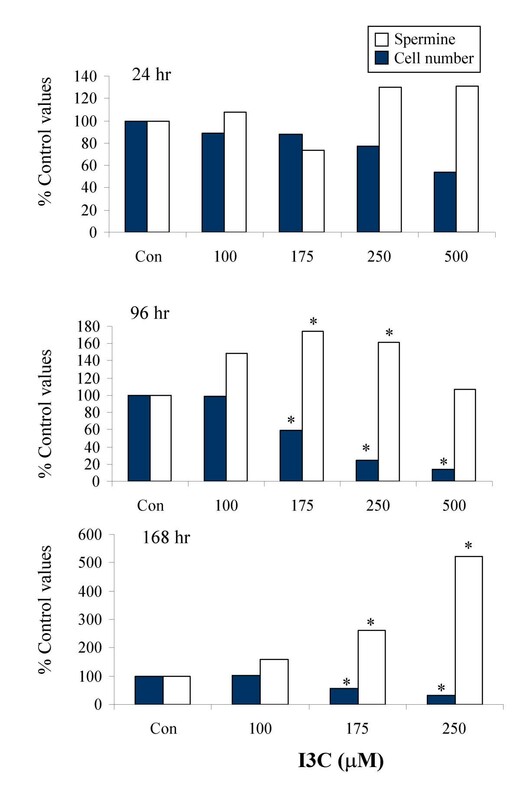 Exposure to I3C for 24 hr resulted in a significant decrease in intracellular putrescine levels, which was completely reversed by co-exposure of the cells to exogenous putrescine (Fig 7; Table 1). The I3C-induced decrease was transient, as by 96 hours of treatment, intracellular putrescine was found to be slightly raised above control levels. Levels of spermidine were not consistently altered at any time point during exposure to I3C (Table 1). In contrast, at each time point, levels of intracellular spermine were increased in cells treated with I3C concentrations that caused a decrease in cell number (Fig. 8), indicating a possible inverse relationship between spermine accumulation and cell growth. While co-administration of exogenous putrescine restored intracellular putrescine levels to normal, it did not alter intracellular levels of spermine in control cells, or prevent the accumulation of spermine in I3C-treated cells (data not shown). The total intracellular level of the three polyamines was also increased in response to I3C, in a pattern corresponding with that of the major component, spermine. Effect of I3C in the presence or absence of putrescine on intracellular putrescine levels in SW480 cells following 24 hour treatment. Cells were cultured with DMSO alone (Control) or I3C (175 μM) in the presence of 0, 20 or 50 μM putrescine as indicated. Intracellular putrescine levels were determined by HPLC, as described in Materials and Methods. Results are presented as mean ± pooled SD (shown on control bar only, n = 4). nd = value not determined. Significant difference from the control (DMSO without putrescine), and from I3C without putrescine, is indicated by a and b respectively (P < 0.05). Effect of I3C on cell number and intracellular spermine levels in SW480 cells after 24, 96 or 168 hour treatments. Cells were treated with DMSO alone (Con) or I3C as indicated, and intracellular spermine levels were determined by HPLC, as described in Materials and Methods. Results are presented as percentage of control values (mean n = 4; * indicates significant difference from control levels (P < 0.05); pooled SD = 0.8, 0.6, 1.1 and 24.4, 11.8, 12.0 for spermine levels and cell numbers respectively at 24, 96 and 168 hours). The mean spermine concentration (nmol/106 cells) in control cells at 24, 96 and 168 hr was 2.10, 1.25 and 0.76 respectively. Effect of I3C alone and in combination with putrescine on intracellular polyamine levels at 24, 96 and 168 hours. Cells were treated with I3C alone or in combination with putrescine, and intracellular polyamines determined as described in the Methods Section. Data shown for cell numbers are expressed as a % Control, and polyamine levels are nmol/106 cells. All values are means with SD in brackets. nd = values not determined. * indicates a value that is significantly different to the control value at that time point. In a preliminary experiment (assays performed in duplicate) intracellular levels of GSH were determined in extracts from cells treated for either 24, 96 or 168 hours. No evidence for a decrease in GSH level was obtained with any treatment at any of the time points (data not shown). In order to further investigate the effect of I3C on regulation of the intracellular putrescine pool, we determined putrescine uptake following treatment with I3C alone or in medium supplemented with putrescine. SW480 cells which had been treated with I3C under normal growth conditions for 24 hours exhibited a 50% decrease in the rate of putrescine uptake (Fig 9), which appeared to correlate with the decrease in intracellular putrescine levels shown in Fig 7. DFMO increased the rate of putrescine uptake 2.5-fold over control levels (Fig 9). Effect of I3C on putrescine uptake in SW480 cells. Cells were treated with DMSO alone (Con), I3C or DFMO as indicated, and putrescine uptake determined as described in Materials and Methods. Results are presented as percentage of control values (n = minimum of 4) * indicates significant difference from control levels (P < 0.05). Upregulation of ODC has been implicated as a necessary and early step in carcinogenesis. The ability of some chemopreventive agents, such as DFMO, to inhibit ODC activity is therefore thought to be an important mechanistic contributor to their anticarcinogenicity. The results described above show for the first time that in colon cancer cells I3C decreases ODC activity and interferes with intracellular polyamine levels. However, there are intriguing differences between I3C and the classical ODC inhibitor, DFMO. Consistent with the known mechanism of action of DFMO, exogenously added putrescine antagonised growth inhibition caused by this agent. In contrast, while I3C also reduced ODC activity and decreased intracellular putrescine levels, its growth-inhibitory effect was not reversed, and in the case of the SW480 cell line, was actually increased in the presence of exogenous putrescine. This led us to conclude that in the colon tumour cells studied here, the growth inhibitory effect of I3C appeared to be independent of its ability to decrease intracellular putrescine levels. This conclusion is further supported by the observation that exogenously added putrescine restored intracellular putrescine levels of I3C-treated cells to normal. It is worthy of note, that while exogenously added putrescine can reverse growth inhibition due to impaired polyamine synthesis, it cannot reverse growth inhibition caused by altered polyamine catabolism or efflux. It is possible that the decrease in putrescine observed at the initial time point, was not wholly due to inhibition of ODC activity or decreased uptake, but also due to the continued conversion of the diamine to spermidine, levels of which did not fall in response to I3C treatment. Putrescine levels in SW480 cells were also found to have reverted to control levels after 96 hours of treatment with I3C alone indicating that the cells overcome these initial effects of I3C observed at 24 hours. Several possibilities may account for this, including reversal of the inhibition of ODC activity and/or putrescine uptake observed after 24 hour treatment. I3C treatment of SW480 cells resulted in an accumulation of intracellular spermine over time (up to approximately 5 fold above control levels), which corresponded with a dose dependent decrease in cell number at each time point. There are many reports in the literature detailing the cytotoxic effects of spermine [76–81], although it should be noted that high concentrations of exogenous spermine were used in these studies. 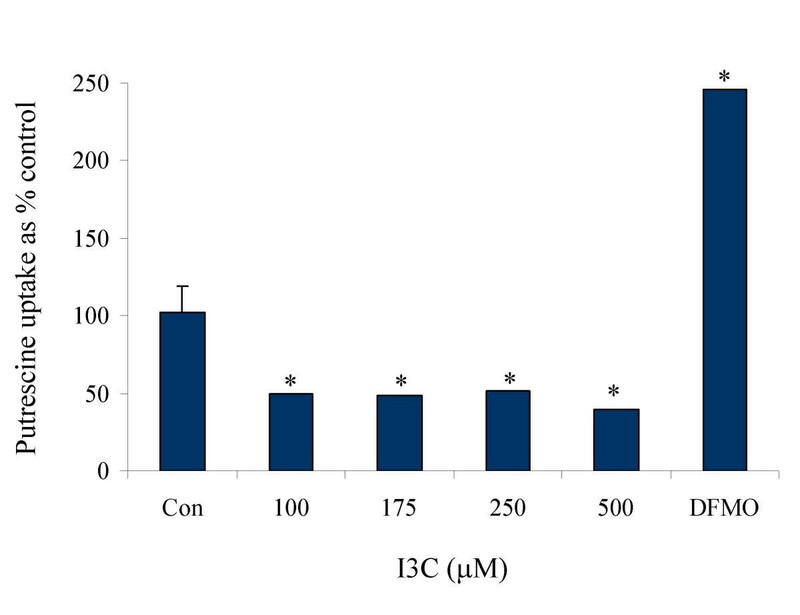 It is possible that the accumulation of spermine seen in response to treatment with I3C contributes to its growth-inhibitory action in this cell line. Addition of exogenous putrescine, did not prevent (nor significantly increase), the accumulation of intracellular spermine levels observed in response to treatment with I3C, which may explain, at least in part, the inability of exogenous putrescine to prevent the I3C-induced growth inhibition. Several mechanisms have been proposed for the cytotoxicity of spermine, including competition for spermidine and Mg2+ binding sites, thus preventing many of the physiological functions of spermidine and Mg2+, such as protein synthesis, as well as loss of intracellular glutathione through conjugation or spermine-induced oxidative stress, or a direct toxic effect of the spermine itself [78, 80, 81]. In preliminary experiments we found no evidence of a decrease in intracellular GSH levels following any treatment. Seiler et al. have reported a non-apoptotic mechanism of cell death in CaCo-2 cells that had accumulated high levels of spermine (more than double normal levels). In that study, exposure to 5 mM spermine caused a decrease in the population of cells in G1, and an accumulation in the G2 phase of the cell cycle . In our study, at higher concentrations (≥ 250 μM), I3C caused induction of apoptosis accompanied by necrosis, but only a small increase in either was observed at the 96 hour time point with 175 μM I3C, and although we did not obtain a clear phase specific arrest with any treatment in our study, the proportion of cells in G1 decreased and the number in G2/M increased in response to I3C from 32 hours. In the combination treatment (I3C + putrescine), the number of cells in G2/M was slightly increased and the proportion of cells undergoing necrosis was significantly increased compared with I3C treatment alone. Although each of these changes appears to be small when considered in isolation, in combination they may be sufficient to account for the inhibition caused by I3C in the cell growth experiments. At 96 hr, control cells showed combined apoptosis + necrosis of less than 4%, with approximately 8% of cells in G2/M; I3C (175 μM)-treated cells showed combined apoptotic and necrotic cells of 9%, with 11% in G2/M, while of I3C + putrescine-treated cells, approximately 16% were undergoing apoptosis or necrosis, with 13% in G2/M. The mechanism by which I3C inhibited ODC activity was not further investigated in this study, but clearly occurs at a level distinct from the direct enzyme inhibition caused by DFMO. ODC activity can be regulated via many signalling pathways, including the epidermal growth factor receptor, PI3K, and estrogen receptor pathways [41–44], which are potential targets for the action of chemopreventive agents such as I3C. We have shown, for example, that I3C can inhibit the PI3K/ protein kinase B pathway in the MDA MB468 breast tumour cell line, but not in the normal derived HBL100 line , but this did not correlate with the ability of this agent to inhibit ODC activity in those cell lines (Howells L.M. et al. unpublished data). There are clearly multiple possible mechanisms via which I3C could exert its effect on ODC activity in these colon cell lines, including inhibition of signalling pathways such as those mentioned above. Our conclusion from this work is that inhibition of ODC activity and consequent decrease in intracellular putrescine levels does not, per se, constitute a primary mechanism of action of I3C in these colon cell lines. However, perturbation of polyamine homeostasis leading to increases in intracellular spermine levels may contribute to a cytotoxic effect of the agent. The exact mechanism by which putrescine sensitised the SW480 cell line to I3C has not yet been elucidated, and the relevance of this observation to future chemopreventive strategies involving I3C remains to be determined. We would like to thank Drs Andrea Pfeifer and Elizabeth Offord (Nestle Ltd. Research Centre, Lausanne 26, Switzerland), for the generous gift of the HCEC cell line. EAH conceived of the study, and participated in its design and coordination, drafted the manuscript, and carried out the experimental work except as follows. LMH contributed to the proliferation and ODC activity studies. BG-H contributed to the apoptosis studies. LHF contributed to the proliferation studies. AG and MMM participated in the design and coordination of the study. All authors read and approved the final manuscript.